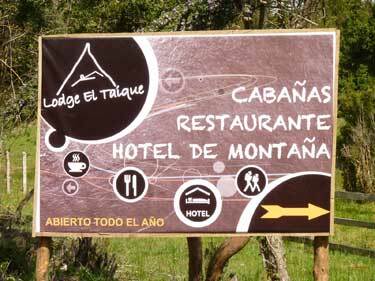 How to reach the Lodge el Taique? To reach the Lodge el Taique coming from Osorno, you must take the international road 215 towards Argentina for 60 km (you have to pass the village of Entre Lagos and drive 11 km after the village in the direction of Argentina). Arrived at kilometer 60, turn right towards El Encanto. Drive 4 km on this dirt road. After 4 km you reach another crossroads. Turn left onto a gravel road in very good condition, in the direction of El Taique sector. Drive 4 km on this road and you will arrive at the Lodge el Taique. At each intersection, you will find our signs to guide you!